Last season I shared a post about my kitchen cabinets as I rubbed some pretty on to make them both functional and pretty. These cabinets are my baking center! This is the ideal time of year to clean out your kitchen baking shelves and get them fresh and ready for seasonal and holiday baking. If you're prepared it makes being in the kitchen more enjoyable. It's FASTER to work in an organized space. It doesn't take long to wipe down, re-stock, and line up your shelves. Plus! 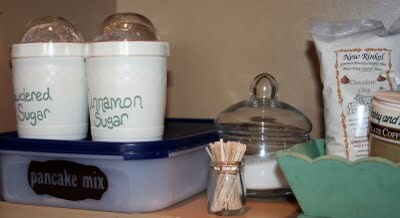 It's a great project to do when it's too brisk outside and the cozy indoors are more enticing. Enjoy creating a baking center in your sweet kitchen. I wanted to share a collection of fall flavors that promote the cozy warmth of the season using fall favorites: pumpkin, cinnamon, apples, maple, and more. To see full recipes and details, click on the titles below. This seems like a perfect time to request yummy food. Specifically, I would like more of those apple muffins! On a different note, I opened the cabinet last night to find Nyquil for the first time in at least a year. It was very helpful seeing a basket neatly labeled "medicine". Thank you for the work you put into making it easy. You have inspired me. I m going to create a baking station this week! Bring on the pumpkin recipes! UGGGHHH!! You're making me HUNGRY!!! Love those little acorn cookies! I have a baking station - although admittedly not as cutely arranged as yours! Hmmmm...guess that's another weekend project to add to my list! Seems we both have fall/winter homekeeping on the brain! Your photos are so lovely. 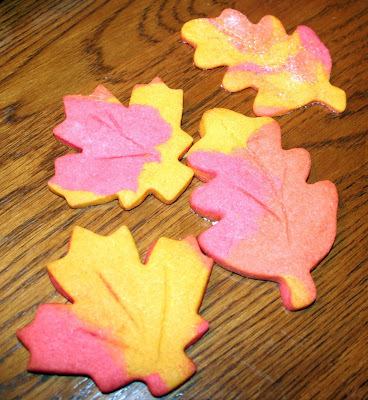 I especially like the leaf cookies. Yum! 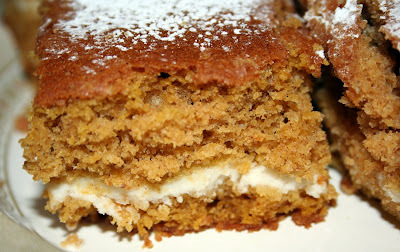 Pumpkin recipes are my favorite things this time of year!! 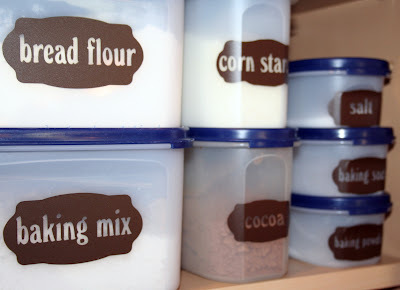 I love your organized baking cabinets, and those labels- so cute! Lisa, wow. Even your cupboards look charming! 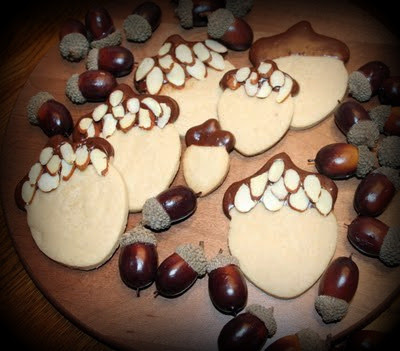 I love the idea of the acorn cookies. I think I might have my Thanksgiving favors figured out now! If I find the right size of cutter I can pipe on names and use them for placecards, too! Hi Lisa! Love your baking shelves! They are so organized and cute:) I am now following you thanks to Buzz on By Thursday and it would be so nice if you could share the love back on my blog:) Oh and totally with you: being organized in the kitchen does make it more enjoyable. Have a great day and feel free to check out our new easy tutorial going on today! Happy Thursday! What a delicious looking assortment of desserts. I love your cookies. Somewhere I have a bunch of acorn cooky cutters that I had intended to fill with chocolate and decorate, bag and use as little place setting gifts, but who knows where they are now. Sigh. Everything looks sooo yummy. Those cookies are just gorgeous. The kiddies would love them, they are so colorful. I am certainly hungry now! Oh Lisa I remember that post!....PLEASE come organize me like that!! and all those recipes look SO yummy....but I LOVE the cupcakes with the twine tied around them!! too cute! Everything looks yummy! Love your baking station, too. What a beautifully organised cupboard! And your recipes look and sound delicious. Your shelves are so cute! Makes me wish I had the room to get everything organized like that! I do have a few tins but I hate that I have to keep refilling them and then flour gets all over! 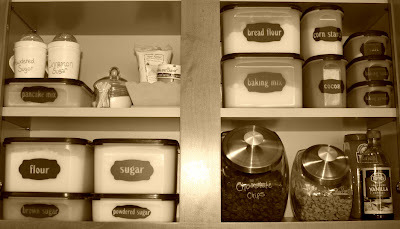 Such a fabulous collection of cute baked goods, and an amazingly organized pantry! WOW! Kudos to you! I love your tupperware! 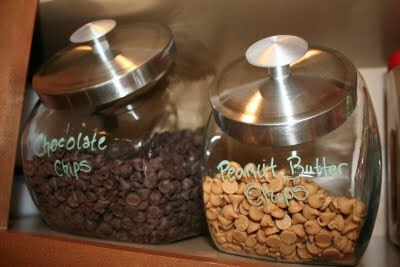 I have my pantry organized like that too! Everytime someone new takes a look at my pantry, they look at me like I am crazy... But I know they are really just jealous on the inside! Love it! Wow! What a slew of wonderful goodies and organization! I love it! You absolutely do the cutest things I've ever seen, Lisa, and those acorn cookies are ADORABLE. Oh, they are cute! 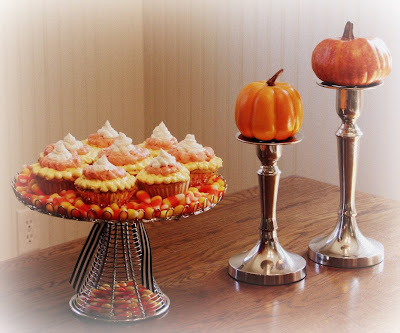 Everything is cute, and I think these are some wonderful fall ideas. Thanks so much for sharing. I dream of a pantry that looks like that. It is gorgeous. I am trying...but it is going to take a lot of work. Wow!! You have such talent. 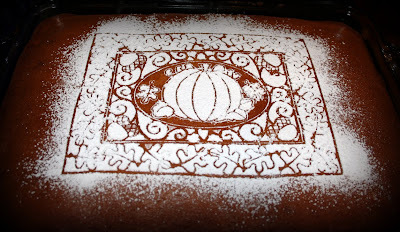 I love the look of the Acorn cookies and the pumpkin cake with the dusted sugar design. So cool!! I'm loving all your fall treats! I'm featuring you this week for my Friday Favorites. Thanks for linking up each week! I love the labels! I think I might just needs some! Thanks for linking up to Topsy Turvy Tuesday's! Hi, loved the DIY emag. 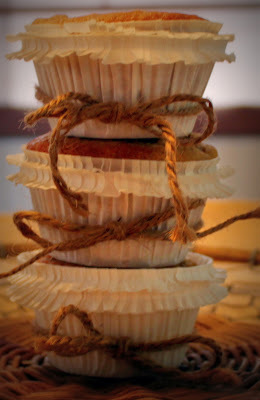 Can you tell me where to get those ruffled cupcake papers? I am your newest follower! I'm very happy to learn this. This is the type of Best Mobile wallet manual to be given and not necessarily the random misinformation that's on the other blogs.